Easter is over for another year and we are back home after a lovely relaxing week away. 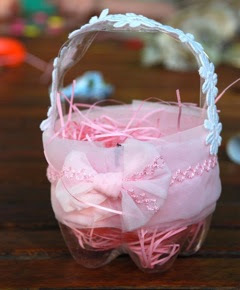 It has always been a tradition in our family to do a few ‘easter crafts’ over the Easter weekend that we spend together. 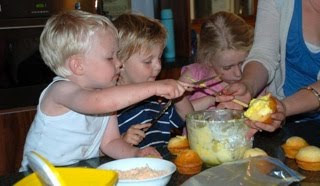 It is always very messy, but lots of fun. Here are some photos of some of the activities that I organised for my children and nephews this year. and our Easter Chick cupcakes which were eaten far too quickly to take a photo of. If you are interested in making some of your own here is an online tutorial. 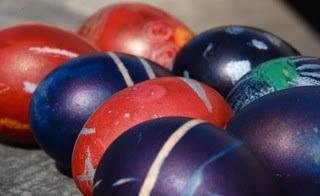 What Easter traditions do you have at your house? Addition (April 2014) For more Easter activities you might like to check out our kids craft page where you will find Easter craft tutorials galore! I always make a batch or two of hot cross buns, which are easier than you might think and even more delicious when homemade. Not to mention filling the house with a wonderful smell. wonderful! a good inspiration for next year for a not-naturally-crafty Mum!